Yet another easy traditional snack for the festival season. Everyone will just love it. Do it yourself instead of buying it from the shops for health reasons. 1. 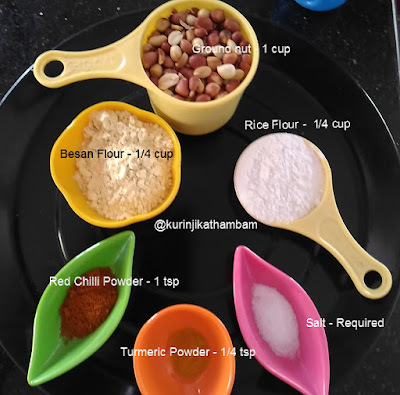 Add besan flour, rice flour, red chilli powder, turmeric powder and salt together in a wide bowl. Mix them well. 2. 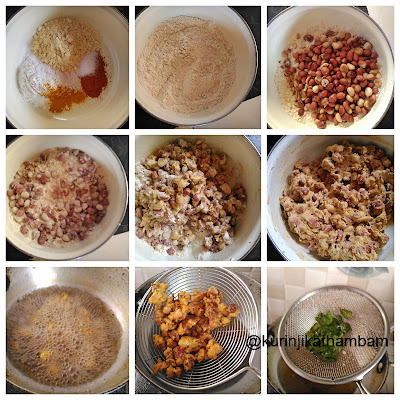 Then add the roasted ground nuts and mix them well. 3. Add water little by little and make the mixture thick. 4. Heat the oil in a deep frying pan, till it becomes hot or put a piece of peanut into the oil. If the peanut comes up immediately, then this is the correct stage of oil heating. 5. Then sprinkle the peanuts over the hot oil. Separate the peanuts using the ladle. Turn over the peanuts occasionally using the ladle to cook evenly. 6. Cook them till the bubbles stops completely. Then take them out from the oil using the ladle. 7. Drain the excess oil using the tissue paper. Repeat the process for remaining peanuts. Then cool down completely and store it in an air tight container. 8. If you have used curry leaves, deep fry the leaves and mix with the peanuts. Really healthy and tasty snack is ready!!! 1. You can add hing, garlic, fennel seeds for extra flavor. 2. Do not over load the oil. 3. Adjust the water level according to your flour texture. 4. Do not add more water otherwise peanuts will absorb more oil. 5. Throughout the process keep the flame at medium. 6. You can use skinned, un skinned or partially skinned peanuts. 7. If you find it difficult to separate the peanuts while cooking, you can do it after the frying also. All times favourite snacking. ... !!! Lovely presentation !!! 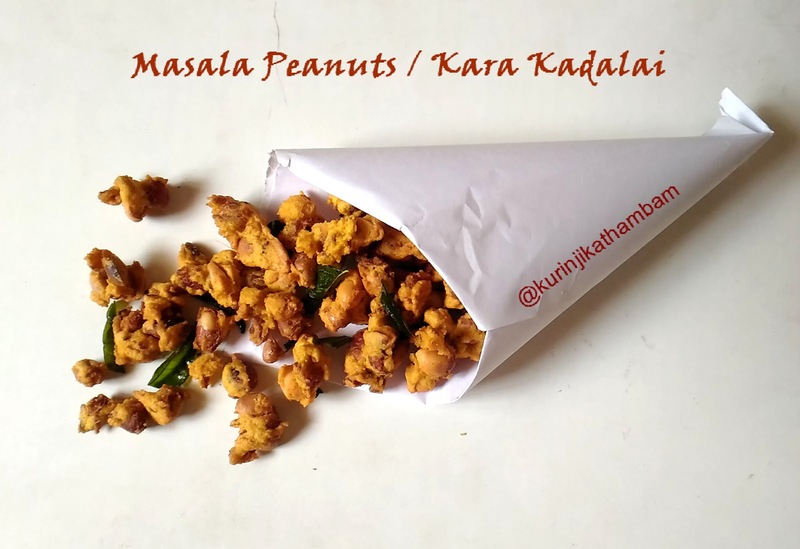 This is the Favourite snack we usually buy from shops, thanks for sharing the recipe. Please check http://rarelicious.wordpress.com for South Indian, millets and kids friendly recipe!